As part of the The Freelands Lomax Ceramics Fellowship, Wysing is hosting Athanasios Argianas for a period of three weeks in March 2019 where he will be using the Wysing Polyphonic Recording Studio. Argianas' interdisciplinary practice encompasses sculpture, painting, text, performance and music. His work draws on his musical background and is concerned with the physicality of sculpture and the immateriality of performed lyrics or poetry. 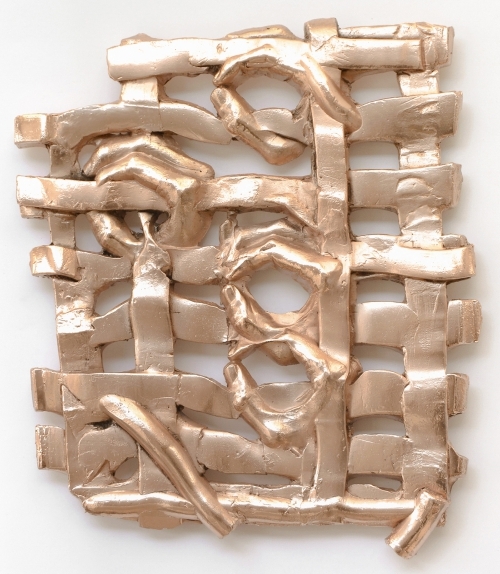 Interested in how a song can physically occupy a space, or how a natural form can generate a piece of music, Argianas employs clay as a cast material, transforming it into electroformed copper or jesmonite to create reliefs based on poems and the structure and cycle of songs. The Freelands Lomax Ceramics Fellowship was launched in 2017 and offers an annual residency at Camden Arts Centre, followed by an exhibition. Argianas is the second recipient of the Fellowship. For more information, please visit the Camden Arts Centre website, here. Athanasios Argianas (b. 1976, Athens) lives and works in London and Athens since 1997. Argianas' recent exhibitions include: Line, Lisson Gallery, London, The Promise Of Total Automation, Kunsthalle Wien Antidoron, Documenta 14 at Friedricianum, Kassel, readingmachinesmovingmachines (solo) at On Stellar Rays, New York, Art Of Sound, at Fondazione Prada, Ca Corner, Venice, The Pulitzer Foundation for the Arts, St Louis, MO. In 2012 his work was featured in The Imminence of Poetics – The 30th Biennale of Sao Paulo, Pavilhão Ciccillo Matarazzo, Brazil, and at PERFORMA 13 New York a year later. He has held solo exhibitions and performances at We All Turn This Way, The Serpentine Pavilion, Serpentine Gallery, London, The Length Of A Strand Of Your Hair, Of The Width Of Your Arms, Unfolded at EMST National Museum Of Contemporary Art, Athens, The Length Of Your Arms Unfolded, the Barbican Art Gallery, London. Argianas runs Daedalus Street with Rowena Hughes, a project facilitating the development of new artworks by invited artists in their studio in Athens.